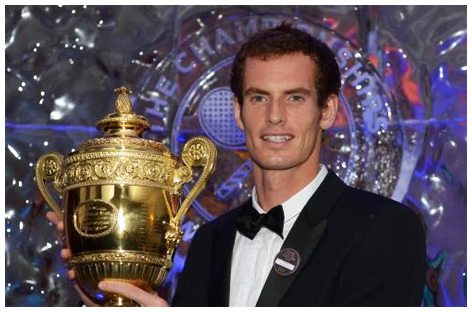 Polling a record breaking 56% of the votes cast, Wimbledon Men’s Tennis Championship winner Andy Murray won the 2013 BBC Sports Personality of the Year on 15 December. Although the event took place in the hugely impressive First Direct Arena in Leeds, Andy received the iconic trophy from Martina Navratilova at his Miami training base. His historic win on the hallowed turf at SW19, the first by a Briton in 77 years, ensured his rightful place in the sports history books. Leigh Halfpenny, the Wales and British & Irish Lions rugby union player got the runners-up slot, with popular jockey AP McCoy in third place following his win at the event in 2010. In 2012, Bradley Wiggins was the popular winner following his triumphant victory in the Tour de France and his Gold medal in the Olympic Time Trial. His fellow cyclist Mark Cavendish picked up the award in 2011, with AP McCoy awarded the 2010 honour. Originally conceived in 1954, the BBC Sports Personality of The Year Awards have been held annually, and since 2006 have been held in different venues around the UK. Taking place in December every year, the awards honour all of the country’s top sportsmen and women who have achieved something special or notable during the year. The ceremony culminates in the presentation of the highly recognisable silver plated trophy of a TV camera with a four turret lens. There are two runners-up each year for the BBC Sports Personality of The Year Awards, and they receive smaller versions of the trophy. Other awards on the night can also include the Overseas Sports Personality of The Year, the Sports Personality of The Year Lifetime Achievement Award and several others. Having evolved from a 45 minute show into a live and glitzy TV show watched by millions of sports fans, the BBC Sports Personality of The Year Awards is a great way to bring so many sporting achievements together into one place. The move from London to larger venues outside the capital enabled tickets to be sold to the public, and the popular telephone voting system for viewers that takes place during the show enables anyone to vote for who they would like to win the top BBC Sports Personality of The Year Award.